Axis Bank Ltd has launched a Happy Ending Home Loan scheme to attract new customer. Under this scheme, you can avail a Home loan for purchasing an under construction/ ready/ resale house self-construction, plot plus construction loans. This scheme has built in EMI waiver benefit, under which the bank will write off the last 12 installments if the customer stays with it for at least 15 years. At first instance this cheme is quite appealing and anyone can go ahead with this scheme thinking that EMI waiver is great benefit. Wait don’t go for this scheme before reading following review. 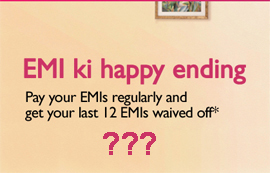 Nothing is free in this world than why Axis Bank should waive off 12 EMI, ultimately 12 EMI is huge money. To find the answer we have investigated scheme detail & here are some of the finer details of this product. – This loan scheme is applicable only for loans with tenure of 20 years and more. So catch point is you are eligible for this scheme only if your age is less than 38 years, as bank consider 58 Year as retirement age. – Another catch is in order to participate in this scheme you should continue this home loan for 15 years or above it means that if you close your loan before 15 years than you are not eligible for this waiver benefit. To continue home loan up to 15 years you stay away with repayment & continue for longer period. Longer period means more EMI and more interest payment. So ultimately bank is at winning age and you are at loss. – Interest rate charged under happy ending home loan scheme is higher than market rate. For Home loans less than Rs 25 lakh, the rate of interest under this scheme will be 10.75% in same segment SBI is offering loan @10.25% and HDFC is offering @10.5%. For Home Loan between Rs 25 lakh and Rs 75 lakh, happy ending home loan scheme is offering 11 % in same segment SBI is offering 10.4% and HDFC is offering 10.75%. Above 75 lac happy ending home loan scheme is offering 11.25% whereas SBI is offering 10.4%. Ultimately in order to take benefit for 12 EMI waiver benefit you have to take home loan with higher interest rate. – Loan processing fees under this scheme is very high @ 1% of loan amount. If you compare with other bank. SBI Home loan processing fees is 1000 Rs/- whereas HDFC home loan processing fees is 10000 Rs/- + service tax. Imagine for taking home loan for 30 Lac you have to pay 30000 Rs/-. – Customers do not have flexibility to change home loan tenure or EMI’s. So at anytime if you wish to increase your EMI you cannot do so. – Customers do not have flexibility to convert loan from floating rate option to fix rate loan option. So once you take this loan you are fixed. – No change is allowed in EMI date. EMI cycle will remain 5th of every month for every customers any deviation will cause disqualification from EMI waiver. – Customer is not allowed to switch loan from Axis bank to other. Last 12 EMI principal outstanding excluding interest component. The 12 EMIs as computed at the time of disbursement. Looking at above point customer is at loss everywhere except 12 EMI waiver benefit. If you feel this waiver benefit gives you great saving hold until we look at following number game example. Let’s take an example of a 20-year Rs 30 lakh loan with a rate of 11%. The total cost of the loan, excluding the 1 percent processing fee (Rs 30000) would be Rs 10046050 but with 12 EMI’s waived off, you would save around Rs 339393 and the total cost of the loan would come down to Rs 7225145 (including 1% processing fees). State Bank of India’s offers cheapest home loan with rate of 10.40 % per annum so similar home loan will cost you Rs 7241954 (including 1000 Rs/- processing fees) in SBI. Axis bank home loan is cheaper by just 16809 Rs/- in another word saving of 339393 Rs/- is translated to cost saving of just 16809 Rs/- only. Only incentive given in this scheme is 12 EMI waiver benefit, nothing else. And to get this benefit you have to continue your home loan up to 15 years. So, if you are prepaying, it has to be done in such a way that the tenure remains above 15 years. As per us if banks want to give a discount, they should give it up front and not like this. As RBI has removed prepayment penalties, by this scheme bank want to ensure that customer should stay with the bank for longer period so that bank earns more money. Think thrice before purchasing Axis Bank Happy Ending Home Loan Scheme. First of all the sales person who provies you the information are not experienced. They even not know the list of all documents to apply for home loan. They will get submit all your documents what ever you have in place on very first day and will tell you the loan got applied successfully and will tell you wait for 10 days. After 10 days when you will call for approval letter they will tell you new document which was not asked earlier. Now again will start procedure from start and will tell you to wait again for 4-5 days. This procedure will go for at least 1-1.5 months. When you start frustrating and shouting on them then they will start working on it. Now you will get approval letter. When you will ask for disbursement of certain amount they again will tell you documents to submit and again same procedure will get repeated. I got the check after 2 months of applying home loan and have to pay 3 lacks rupees as a interest to builder.